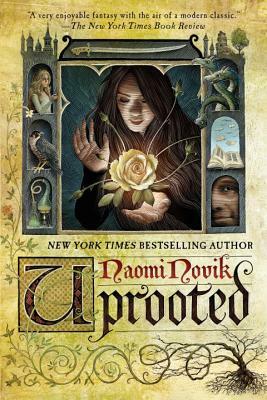 Uprooted is a book about relationships: between a methodical master and his slapdash apprentice; between two best friends that support each other when alone they would fail; and between the individual and her community, no matter what distance may separate them. Like the magic within its pages, Uprooted derives its greatest strength from these connections. Naomi Novik is the acclaimed author of the Temeraire series: His Majesty’s Dragon, Throne of Jade, Black Powder War, Empire of Ivory, Victory of Eagles, Tongues of Serpents, Crucible of Gold, Blood of Tyrants, and League of Dragons. She has been nominated for the Hugo Award and has won the John W. Campbell Award for Best New Writer, as well as the Locus Award for Best New Writer and the Compton Crook Award for Best First Novel. She is also the author of Uprooted and the graphic novel Will Supervillains Be on the Final? She lives in New York City with her husband Charles Ardai, the founder of Hard Case Crime, and their daughter, Evidence, surrounded by an excessive number of purring computers.